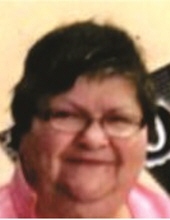 Geraldine L. SearVogel, age 71, died peacefully at her home on Wednesday, January 23, 2019. Funeral services will be held at 12 noon on Saturday, Feb. 2, 2019 at the First Presbyterian Church in Cambria with Rev. Kristin Frederich officiating. Burial will follow in Cambria Cemetery. Relatives and friends may call on the family at the church on Saturday from 10 am until the time of services. Geraldine was born on Oct. 31, 1947 the daughter Herman Alex and Myrtle (Randall) Schraufnagel. She was united in marriage to William SearVogel on Aug 10, 1968 at St. Patrick’s Church in Doylestown. Geraldine worked for a local canning factory and then was employed for over 26 years with the former Wisconsin Cheeseman’s in the Scott’s Candy department. She loved canning her garden vegetables and tending to her flower beds. Geraldine was a member of the First Presbyterian Church in Cambria. Geraldine will be sadly missed and mourned by her husband, William of rural Rio; her son, Mike (June Witthun) of Cambria; her five grandsons, Alex, Aaron, Evan, Erick and Asher, all of Cambria; two sisters, Donna Olson of MN and Mary (Mike) Schumann of Fall River; one brother, Eddie (Christine) Schraufnagel of AZ; her step-mother, Eleanor Schraufnagel of Columbus; one sister-in-law, Karen (Everett) Christopherson of Rio; nieces, nephews, cousins, several other relatives and many friends. Geraldine was preceded in death by her father and mother, a brother-in-law Richard, two step brothers and her parents-in-law. The Kratz-Smedema Funeral Home in Cambria is serving the SearVogel family. For more information please visit www.kratzfh.com. To send flowers or a remembrance gift to the family of Geraldine Linda SearVogel, please visit our Tribute Store. A fellowship luncheon will follow the graveside services back at the church. "Email Address" would like to share the life celebration of Geraldine Linda SearVogel. Click on the "link" to go to share a favorite memory or leave a condolence message for the family.